Gerald Gamm begins his book, Urban Exodus: Why the Jews Left Boston and the Catholics Stayed with a poignant vignette. The former Congregation Mishkan Tefila, once a handsome and dignified building, is now abandoned, surrounded by weeds, the interior gutted, the congregation dispersed. A passing neighbor has no idea what it was built for. But a nearby church, St. Peter’s, erected for an Irish-Catholic congregation, has evolved into a thriving parish church that serves Haitians, Latinos, African Americans, and Asians. Even when I first read Gamm’s book, I resisted the implicit value judgment. He describes the former synagogue much as Gibbon depicts a ruined Rome. But the Jews who used to worship there weren’t persecuted; they moved to Newton and built a suburban temple (see right). Their original neighborhood wasn’t deserted; it shifted from Jewish to Afro-Caribbean. Since the building had value, it was reclaimed. Today it is the United House of Prayer for All People, a Pentecostal church of Cape Verdean origin. 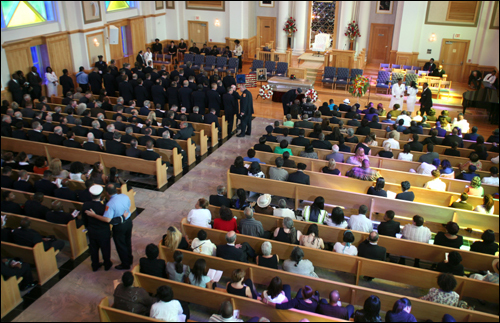 Here is a picture of a firefighter’s funeral inside that church. Senator Kerry and many other dignitaries are attending, along with a large and devoted congregation. So this story is not a tragedy. But it is an important case to understand if you want to improve your community. You might, after all, be a rabbi or an active member of any congregation, trying to hold onto your original and distinguished building. You might be a Pentecostal minister trying to save souls and find a safe place for your immigrant community. You might be an integrationist, trying to encourage a mix of people to live in an urban neighborhood. Or you might be a planner or preservationist hoping to make the best use of large buildings and public spaces. In any case, you need to know–as Gamm’s subtitle asks–why the Jews left and the Catholics stayed in Boston. When we address questions like that, we usually think in terms of individual values and motivations. So if the Jews left Boston and the Catholics stayed, the difference must reflect something inside their heads: different attitudes about the racial minorities who were moving in, different attitudes toward suburban life, different levels of willingness to abandon their peers, etc. Moral judgments seem appropriate, and if we want to change outcomes, we’re tempted to persuade people to think differently. I would not rule out a moral evaluation of personal choices, such as where to live. But here are three other perspectives. 1. Dilemmas of uncoordinated action. As I noted recently, if everyone actively prefers to live in a diverse neighborhood but wants his or her group to be in the local majority, perfect segregation will result. That is an example of how outcomes do not directly reflect goals or preferences. Segregation is compatible with–in fact, it results from–a preference for diversity. 2. Norms, practices, and networks that exist at a community level. If most people in your neighborhood are highly connected to each other, not only liking one another but also working collaboratively, then you can bet that they will resist moving (for better or worse). Thus, even if you happen to be a rather antisocial individual, you should expect stability in the neighborhood and plan accordingly. On the other hand, if everyone around you lives a private life and doesn’t even know his neighbor’s name, then you can bet on instability, even if you happen to be a highly social and committed individual. Since values tend to result from practices, a lack of interaction doesn’t imply that your neighbors are antisocial at heart. It may just be that opportunities for cooperation are missing. 3. Rules. This is where Gamm comes in. He notes that demographically similar congregations of Jews and Catholics have reacted in consistently different ways whenever their neighborhoods change (regardless of what kind of newcomers are arriving). Jews quietly leave. Catholics resist in various ways. Jewish congregations relocate. Catholic parish churches stay put, but their demographics shift. He traces the difference to “ancient rules” that “dictate” outcomes by “their own inexorable logic” (p. 17). For example: membership in a Catholic parish is defined by residential location, whereas membership in a synagogue is a choice. A parish has a sharp outline on the map; members of a synagogue may live all over the region. A Catholic church is consecrated and is not supposed to move physically. A synagogue is made holy by its Torah scrolls, which are portable. A parish priest is appointed by a bishop, who also provides funds. If the bishop orders the priest to stay at St. Peter’s, the priest stays and St. Peter’s retains its budget. A rabbi works for a congregation, which is a voluntary association. If all the members peel off, the rabbi is out of a job unless the congregation moves with its members. These differences arose literally thousands of years ago. During the Babylonian Captivity, Jews invented congregational worship with an eye to moving. They were in exile and hoping to go back to Israel. In the early centuries after Jesus, Catholic missionaries converted communities and then wanted to hold onto them for the Church. So they developed a territorial system resistant to physical moves. Gamm makes the legacy of the past appear binding, but to me the main lesson is to think strategically about rules. After all, you can make new ones.